This week my sister and I decided to honor Lhakar a few days early. 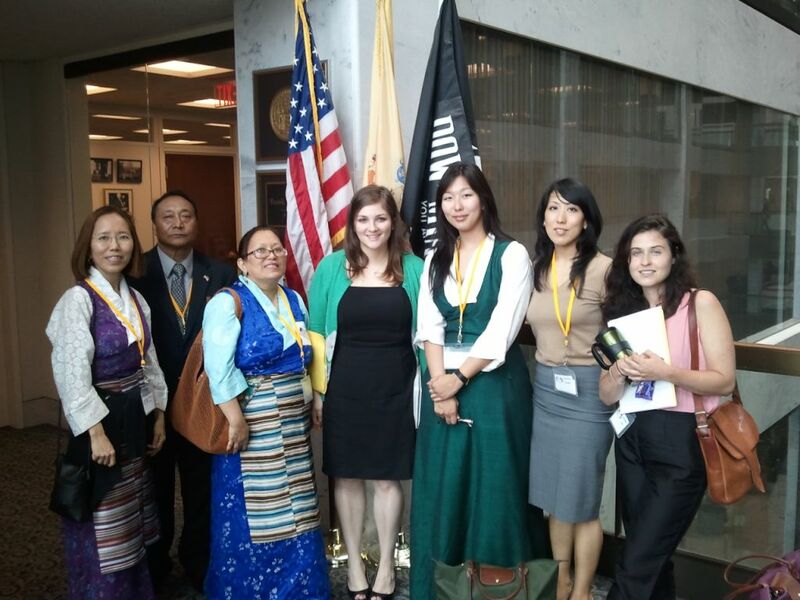 We joined a record number of Tibetan-Americans and supporters in Washington, DC for the 4th annual Tibet Lobby Day. Organized by the International Campaign for Tibet and Students for a Free Tibet we set records on Capital Hill with two days of continuous meetings with our local representatives. Joining Tibetans and supporters in London, Brussels, New Delhi and Canberra this month, who are also meeting with their elected representatives and encouraging them to take action. I first participated in Tibet Lobby Day in 2010, but have never felt as empowered as I did this year. I was joined by four other constituents from New Jersey and one from Maine with whom I attended a total of ten meetings and two drop bys! I was even interviewed by Radio Free Asia about my lobbying experience. I felt prepared after our Lobby training on Sunday, especially after practicing our asks and rehearsing our talking points. During our meetings with Senate and Congressional staff we were encouraged every day by their genuine concern for Tibet. “Having you here is one of the most important things you can do,” one staffer from office of Sen. Collins of ME said to our lobbyists. Hearing us advocate for several resolutions in person made the issue come alive for them. I know staffers see so many requests in their day to day work, but hearing from us face to face gave us a chance to explain what it means to lose programs like the Tibetan News Service at VOA. They were shocked to hear about the proposed elimination by the Broadcasting Board of Governors and were willing to take action. The majority of the staff we visited with had already heard about the self immolations in Tibet, and expressed their concern, asking questions about the current situation as well as the status of the three Tibetans who have been on Hunger Strike in front of the UN for the past 30 days. After two days of meetings, I know we made connections with staffers and hope that we might see results soon with the co-sponsoring of Senate Resolution 356, introduced by Senator Dianne Feinstein (D-CA) and Sens. John McCain (R-AZ), Joseph Lieberman (D-CT), Marco Rubio (R-FL), Richard Durbin (D-IL) Barbara Boxer (D-CA), Mark Udall (D-CO) Jim Webb (D-VA), and Tom Udall (D-NM). The resolution mourns the death of Tibetans and deplores the repressive policies targeting Tibetans. It calls on the Chinese government to release all those arbitrarily detained; to cease the intimidation, harassment and detention of peaceful protestors; to allow unrestricted access to journalists, foreign diplomats, and international organizations to Tibet; and to respect religious freedom. The situation in Tibet demands a response from our elected leaders that Beijing cannot ignore. On Saturday, Sonam Dhargye, a Tibetan farmer and father of three self-immolated. An unprecedented 30 Tibetans have now lit their bodies on fire to protest China’s occupation of their nation. They hoped that their ultimate act of sacrifice would draw attention and action to stop the unbearable oppression the Tibetan people are suffering under every day. Please join the call for multilateral action to end China’s occupation of Tibet so that Tibetans can live in the peace and freedom they have sacrificed so much to achieve. Tags : Lhakar, Lobbying, Tibet, Tibet Lobby Day, Washington D.C.
Pingback: Live Streaming Right Now.. International Campaign for Tibet « Namaste Consulting Inc.